Ebooks are a common type of content that many marketers use, often to help generate leads. They are generally a more long-form content type than, say, blog posts, and go into in-depth detail on a subject. Here’s an awesome ebook on how to write an ebook (so meta). Hashtags are a way for you and your readers to interact with each other on social media and have conversations about a particular piece of content. 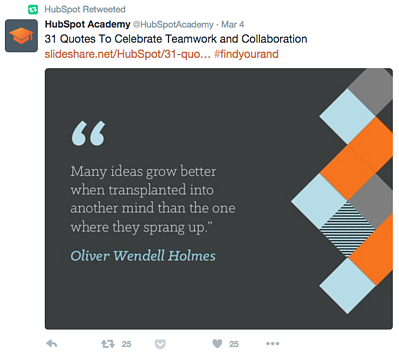 They tie public conversations on Twitter, Facebook, and Instagram together into a single stream, which users can find by searching for a hashtag, clicking on one, or using a third-party monitoring tool like HubSpot’s Social Inbox. A type of online advertising that takes on the form and function of the platform it appears on. Its purpose is to make ads feel less like ads, and more like part of the conversation. That means it’s usually a piece of sponsored content that’s relative to the consumer experience, isn’t interruptive, and looks and feels similar to its editorial environment. Native advertising can come in many forms, whether it’s radio announcers talking favorably about a product sponsoring the show, or an article about a product or company showing up in your news source. Here are examples of some of the best native advertising out there. A news feed is an online feed full of news sources. On Facebook, the News Feed is the homepage of users’ accounts where they can see all the latest updates from their friends. (Learn all about Facebook’s News Feed here.) The news feed on Twitter is called Timeline. The amount of money spent to get a digital advertisement clicked. Also an internet advertising model where advertisers pay a publisher (usually a search engine, social media site, or website owner) a certain amount of money every time their ad is clicked. For search engines, PPC ads display an advertisement when someone searches for a keyword that matches the advertiser’s keyword list, which they submit to the search engine ahead of time. PPC ads are used to direct traffic to the advertiser’s website, and PPC is used to assess the cost effectiveness and profitability of your paid advertising campaigns. Bid-based: where the advertiser competes against other advertisers in an advertising network. In this case, each advertiser sets a maximum spend to pay for a given ad spot, so the ad will stop appearing on a given website once that amount of money is spent. It also means that the more people that click on your ad, the lower PPC you’ll pay and vice versa. 3) You can post a new tweet that includes your own commentary in addition to the information you’re retweeting. The formula is this: Your own commentary + RT + the original tweeter’s Twitter handle + colon + the exact text from their original tweet. This method of retweeting allows you to add your own thoughts, but with a very limited character count. The practice of enhancing where a webpage appears in search results. By adjusting a webpage’s on-page SEO elements and influencing off-page SEO factors, an inbound marketer can improve where a webpage appears in search engine results. For marketers, an SLA is an agreement between a company’s sales and marketing teams that defines the expectations Sales has for Marketing and vice versa. The Marketing SLA defines expectations Sales has for Marketing with regards to lead quantity and lead quality, while the Sales SLA defines the expectations Marketing has for Sales on how deeply and frequently Sales will pursue each qualified lead. A social app that allows users to send and receive time-sensitive photos and videos known as “snaps,” which are hidden from the recipients once the time limit expires. (Note: Images and videos still remain on the Snapchat server). Users can add text and drawings to their snaps and control the list of recipients in which they send them to. For the sake of creativity, I’ll define Twitter in 140 characters or less: “Twitter is a platform that allows users to share 140-character long messages publicly. User can follow one another and be followed back.” There you have it — a tweetable definition of Twitter. A website is a set of interconnected webpages, usually including a homepage, generally located on the same server, and prepared and maintained as a collection of information by a person, group, or organization. An inbound marketer should structure a website like a dynamic, multi-dimensional entity that can be used to attract relevant website visitors, convert those visitors into leads, and close those leads into customers. Otherwise, it’s just a brochure — and let’s be honest — could you really use another brochure? We couldn’t leave “X” out of the party! An XML sitemap is a file of code that lives on your web server and lists all of the relevant URLs that are in the structure of your website. It’s kind of like a “floor plan” for the site, which especially comes in handy whenever the site gets changed. It also helps search engine web crawlers determine the structure of the site so they can crawl it more intelligently. We couldn’t think of anything for “Z.” So I ask you dear readers: What inbound marketing related topic should we define that begins with the letter “Z”?